The 2019 Academic Facility Symposium (#AFS2019) will feature “The Disaster Experience”, a half-day tabletop disaster simulation designed to give facility managers the experience of dealing with a "shelter-in-place" scenario like an active shooter. Attendees will enhance their crisis communications and decision-making skills while taking away the knowledge to improve their own disaster planning and response capabilities. This symposium offers .5 CEUs and 5 CLPs. During the 2019 Healthcare Facilities Symposium (#HFS2019), attendees will gain detailed knowledge on preventing business disruption as a result of the unexpected. Additionally, presenters will offer insight on emerging technologies available to healthcare facility administrators that can greatly aid in managing data and people during a crisis. Finally, the HFS 2019 will provide attendees with a look into workforce development solutions for the healthcare space. This symposium offers .5 CEUs and 5 CLPs. 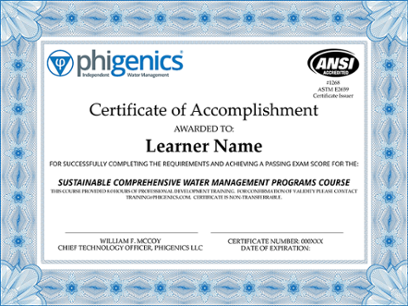 This ONE-day Live Review Course is the only ANSI-accredited offering that educates learners how to develop a water management program that optimizes the total cost of water systems through improving safety and efficiency. It includes detailed instruction of the 7-step process to develop and implement comprehensive and defensible water management programs. The course is in alignment with published industry standards and guidance, including the CDC Toolkit, ANSI / ASHRAE Standards 188:2018 and 189.1:2014, and WHO Water Safety in Buildings 2011. This full day training offers 7 CEUs. This symposium will offer professionals operating academic facilities or providing solutions to academic facilities a comprehensive understanding of how to manage people and resources, particularly data, during a crisis. The 2019 Academic Facility Symposium (AFS 2019) will feature an immersive, interactive presentation entitled “The Disaster Experience”. This symposium will offer professionals operating healthcare facilities or providing solutions to healthcare facilities a comprehensive understanding of how to manage people and resources, particularly data, during a crisis. The 2019 Healthcare Facility Symposium (HFS 2019) will feature an immersive, interactive presentation entitled “The Disaster Experience”.